Great news! We've created a FREE Sample Q Source Anti-Static/Static-Shielding Bag Kit (Q SKU: P999-000784, Manufacturer Part #: SAMPLE-BAG-KIT2) so you can try out a selection of our new, premium-quality anti-static and static-shielding bags. Just add the kit to your shopping cart and the STATICFREE coupon code will be applied automatically. If you're working in areas where electrostatic contamination is an issue, Q Source's Anti-Static Bags are a perfect solution for packaging static-sensitive or non-static sensitive components in these environments. 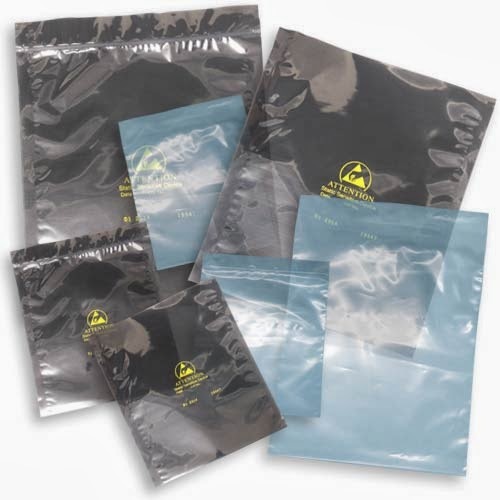 Made from a single-layer on non-amine polyethylene, these bags are non-corrosive, humidity-independent, and meet MIL-PRF-81705D electrical requirements. If you need packaging for static-sensitive electronic components without the compromise of loss of visibility, our Q Source Static-Shielding Bags are a great choice. These static-shielding bags have a 3.1 metallized film made of four layers (static-dissipative coating outer layer, buried polyester, aluminum shield, and a purestat PE inner layer). For complete information about both of these types of bags, please refer to the enclosed data sheets included with your FREE sample order. 3 Mil Blue anti-static bag w/open top - 4" x 6"
3 Mil Blue anti-static bag w/zip top - 4" x 6"
3 Mil Blue anti-static bag w/zip top - 9" x 12"
3 Mil static shielding bag w/open top - 4" x 6"
3 Mil static shielding bag w/open top - 10" x 12"
3 Mil static shielding bag w/zip top - 4" x 6"
3 Mil static shielding bag w/zip top - 10" x 12"
To order your FREE Anti-Static/Static-Shielding Bags Kit, please visit QSource.com. For questions, or additional info, contact us via phone (800-966-6020) or email. Please Note: Limit one Sample Kit per customer. Shipping charges may apply.